It’s been a multifarious outpouring this year on the blog, hasn’t it? A couple of new historical projects were added, sci-fi and fantasy were revisited after a long break, and despite moving house and breaking my elbow I somehow managed to paint up a good number of models. One project was curiously absent, though – Vikings! After painting rank upon rank of Napoleonics, I recently felt the urge to paint up some more Northmen, and so here we are. 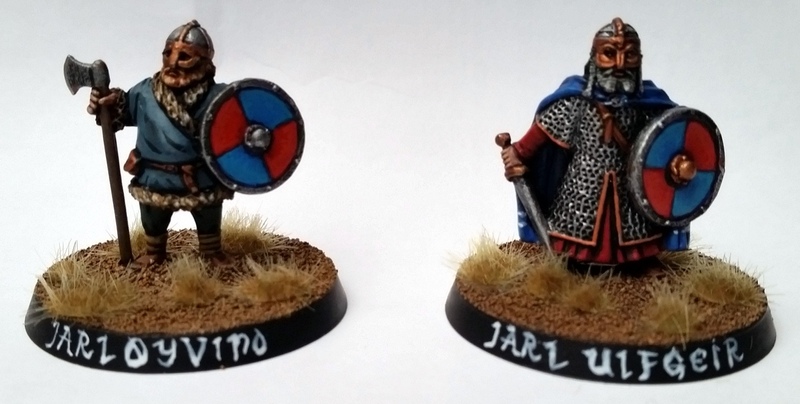 These are both the first Vikings of 2015 and the last painted models I’ll be posting this year, so I hope you’ll enjoy them. 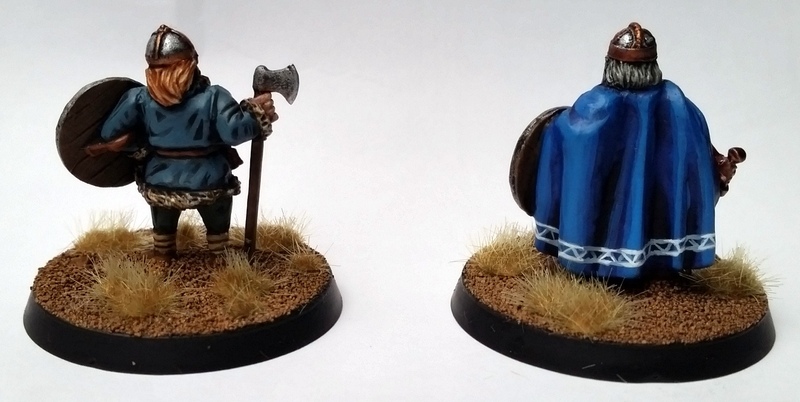 Two models by Shieldwall Miniatures, a range sold by Gripping Beast. In spite of having enough Vikings already I couldn’t resist picking up these models at Crisis ’14. The fat warlord especially is a new favourite of mine. Quite chuffed with how the freehanded pattern on mister Ulfgeir’s cloak turned out. I decided to base and paint these as per my original Saga warband, which I started working on around three years ago. Nostalgia is a powerful emotion! Since then I’ve painted many Vikings but I’ve mostly used much easier techniques – I hope you’ll notice I put some extra man hours into painting these up. More Shieldwall models – four berserkers. I’ve always been dissatisfied with my original berserker models, which were nothing more than overly-armoured plastic hirdmen with dane axes. Thus I have chosen to replace these with the models above. I have a difficult time picking my favourite out of these four, but I think the one named Gorm does it for me – that stripped-down tunic, the rags of which have been expertly sculpted around his waist, is a fantastic feature. I stippled those cloaks – not entirely sure about them. It’s a bit tricky not to overdo, but I felt compelled to add some blood effects to their weapons, as they are, after all, completely bonkers. All the more to set them apart on the tabletop, although that won’t do them any good in Saga at all! That’s it for today! It’s Christmas, so I thought, why not grace you with a blog post full of pagans, eh? I have one more update for you this year, which is my big look-back-at-2015-and-look-forward-to-2016 list. Stay tuned for hints of what is to come, and Merry Christmas or Happy Yuletide – whatever floats your longboat!